Why Did Horned Dinosaurs Have Fancy Frills? Home/Dinosaur and Prehistoric Animal News Stories, Dinosaur Fans, Main Page, Palaeontological articles/Why Did Horned Dinosaurs Have Fancy Frills? Why Did Horned Dinosaurs Have Fancy Frills (and Horns Too for that Matter)? One of the great pleasures of working with so many young dinosaur enthusiasts is that we get to answer lots of their amazing questions. We do get asked all sorts of things, such seems to be the fascination with dinosaurs and other prehistoric animals. Scientists get to ask questions too, after all, the essence of scientific enquiry is all about seeking answers. It is surprising just how often the question asked of us by an eight-year-old overlaps with the sort of enquiries being explored by palaeontologists. Take for example, the question of why did horned dinosaurs have horns and frills? Thanks to a some recently published fascinating statistical analysis, researchers are able to at least rule out one possible explanation for these very ornate and often bizarre examples of dinosaur head gear. Writing in the “Proceedings of the Royal Society B (Biology)”, researchers have concluded that all this ornamentation probably did not evolve to help a dinosaur distinguish itself from another species. Yes, they may have had a role in defence, after all, many of the later Ceratopsians had to contend with Tyrannosaurs in their neighbourhood, but this new analysis lends weight to the idea that the diverse range of headgear sported by horned dinosaurs probably evolved to help them win mates. 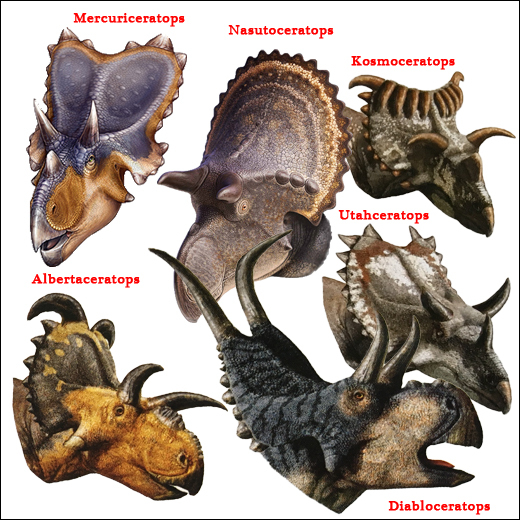 Lots of Horned Dinosaur Species – But Why all the Different Horns and Ornamentation? Illustrations of different horned dinosaurs but why the fancy headgear? The research team which included scientists from the University of London, the Natural History Museum of Utah and the Raymond M. Alf Museum of Palaeontology in California, first set about building a list of all the known horned dinosaurs that had been described to date. The Ceratopsia (horned dinosaurs), is a major clade of the bird-hipped dinosaur lineage, it contains over seventy species, all of which possessed some form of skull ornamentation, from the small “sticky-out” cheek horns of Psittacosaurus from the Early Cretaceous to the spectacular multi-faceted head crests and horns sported by Late Cretaceous giants such as Styracosaurus, Triceratops and Pachyrhinosaurus that lived some fifty million years later. Ornamental traits in the Ceratopsia. Psittacosaurus and Triceratops compared. These horned dinosaurs had very different shaped skulls and to test the idea that these features evolved to help with species recognition, the researchers then set about looking at which horned dinosaurs lived at the same time and in the same parts of the world. In essence, they looked to see if any two species were sympatric – this simply means whether two species live in the same area at the same time and therefore encounter each other. A modern example can be found in the Serengeti National Park, where Impalas and Grant’s Gazelle, two species of antelope, live side by side. There is sympatry between Impalas and Grant’s Gazelle. Once the fossil records for all the known species of Ceratopsian had been analysed by location and when these animals lived, the team set about looking at the physical features of all those species which had enough fossil material associated with them to make any analysis statistically valid. To test the idea that these horns and frills evolved to help in species recognition, there should be some evidence that at some point, several closely related species with different ornamentation lived at the same time in environments that at least partially overlapped and therefore these animals would have encountered each other. Line drawings of Ceratopsian skulls showing different morphology. The red node 1 represents the clade Coronosauria a sub-division of the Ceratopsia that contains all the horned dinosaurs with enlarged frills. Node 2 represents the clade Ceratopsoidea, which is split into two branches, the Centrosaurinae (orange branch) and the Chasmosaurinae (blue branch). It is these two branches, the Centrosaurines and the Chasmosaurines that exhibit the majority of the cranial ornamental diversity. The next step was to classify those differences in the skeleton to separate out any features that may have played a role in inter-species recognition. The scientists looked for anatomical traits within the skeleton. Each trait was classed as either external or internal, based on whether it was likely to have an effect on the exterior appearance of the animal in life. External characters were further subdivided into display and non-display, defined as whether or not the character or trait in question was deemed whole or part of an ornament (i.e. in Ceratopsians, the frill, horns and bosses of the skull). A skeletal reconstruction of the Centrosaurine dinosaur Styracosaurus (S. albertensis). The statistical analysis found no evidence to support the idea that the horns and frills of Ceratopsians evolved to help these animals differentiate themselves from other species that they shared habitats with. Palaeontologist David Hone (University of London), explained that this study suggests that these ornamentations evolved as “social-sexual functions” i.e. as both males and females of each species had similar ornamentation, the horns and frills evolved to help advertise the animal’s condition and fitness for breeding. These skull ornamentations may have been a horned dinosaur’s way of demonstrating that it was healthy, strong and had good genetic make-up. In short, both males and females were advertising their fitness for mating. In evolutionary terms, the more fantastic your head crest and the bigger the lumps, bumps and horns on your face the dinosaur is highlighting that it is fit and healthy. It shows that it can grow lots of bone and carry it around without suffering from any disadvantages, such as being too slow and heavy to avoid a T. rex. Scientists have constructed a model of the Mexican dinosaur called Yehuecauhceratops. Those horns, crests and frills probably advertise the animal’s fitness for breeding. The researchers conclude that the theory that all this ornamentation evolved as a species recognition mechanism, has no statistical support among known Ceratopsians. The various features associated with the vast and diverse family of horned dinosaurs probably had other functions too. 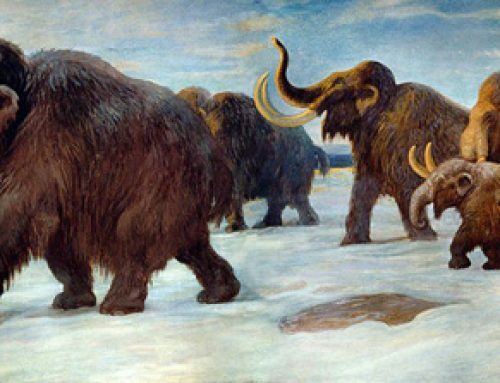 Perhaps they played a role in thermoregulation and they may have functioned as defensive structures, plus they could have had a role in visual communication and display. However, the idea that they developed to aid with inter-species recognition has been rejected by this research team.